The final day of Bloodstock dawned upon the fields of Catton Park and it was an almost bittersweet feeling. The past two days had left most folk feeling a little tired but incredibly excited for what will be a final day of metal goodness. Opening the New Blood stage, Switchblade City confessed, as a rock rather than metal act, they were a little out of place at Bloodstock. It didn’t stop them putting on a fine performance to a busy New Blood tent who appreciated the rousing but comparatively light start to the day. GraVil, over in the Sophie, didn’t hold back. When you have a sizeable portion of the crowd banging their heads in time by your final track, you’re doing something right. Battalion manage to mix groove with very harsh vocals and kept a lot of people happy over in the New Blood before Venom Prison were unleashed on the main stage. Blind Haze entertained the crowd hiding from the evil sun in the Sophie tent with some nice rock n’ roll, while Seething Akira threw their tech beats around in the New Blood. Certainly one of the most mobile bands of the weekend, SA bounced and span their way through a sweaty set. Packing the Sophie tent, Wretched Soul wrought violence while over in the New Blood, Heathen Deity brought blackness and evil to the baying, horn-throwing hordes. Torqued and Courtesans both played to big audiences in their respective tents. Courtesans brought ethereal rock to the Sophie, while Torqued threw some nice metal at the crowd in the New Blood. In one of many tributes this weekend, the Courtesans’ lead singer dedicated a track to her granddad who passed away recently. Puppy are another of the bands on the lighter end of the scale this weekend, but got a great response from the Sophie crowd. Sentience, polar opposite musically, ground down the New Blood audience with much heavy riffage. There’s not a lot to an Obituary show other than the music. No fancy lights or pyrotechnics, but with a back catalogue that strong and John Tardy’s trademark vocals, they don’t need any more. 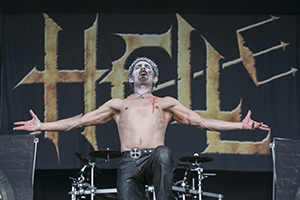 Despite the blazing sunshine, a riotous pit awaited one of death metal’s longest standing acts. 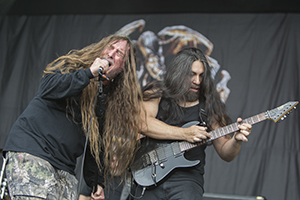 Despite being scheduled against the Floridian titans, Wolfheart pulled in a crowd that continued to grow in both size and response as their set went on. With each of the members having huge smiles and giving their all, they delivered on the best sounding and tightest performances of the weekend. Following on from them and despite clashing with Hell, Oni played to a large crowd in the Sophie tent as did Netherhall in the New Blood. Silverchild had told us that people didn’t expect them to rock too hard as there are two girls in the band. They proved any naysayers very wrong indeed with a cracking set in the Jäger tent, while Na Cruithne lay waste to the New Blood with their Celtic war metal. 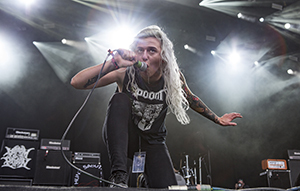 Criminal took on the main stage’s Skindred, and while many were twirling shirts overhead in the late afternoon sunshine, a sadly small number enjoyed the heavier alternative. 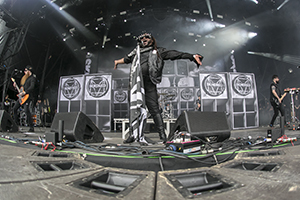 Those who hid from the sun, though, got a thrash-tastic treat. In fairness, Criminal were up against on the the most entertaining, cross-genre bands on the bill. Three bands on at the same time in the run-up to Arch Enemy were Arthemis on the Sophie stage (quality stadium metal with many hands clapping in rhythm), Unitra (Spandex-clad thrash) and Vorbid (more fast, traditional metal). Contending with the main stage in the New Blood tent were Blaakyum from Beirut who, frankly, destroyed all laid before them. Worthy “headliners”, they pulled in a decent crowd but definitely deserved to be playing to more. Over in the Sophie tent, Bossk got a huge crowd rocking with their tri-guitar sound, an absolute wall of groove. 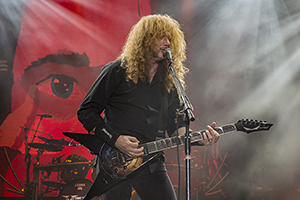 And finally, Megadeth finished the main stage weekend with a bang, playing one of the best sets we’ve seen from them in a while. Covering a genuine “best of” from old to new, they left the crowd battered, sweaty and grinning from ear to ear. And so the final day of Bloodstock ended. We’ve been ‘pursued by vikings’ with Amon Amarth, become an ‘enemy of God’ with Kreator and Ghost and treated to some of the ‘MegaDave’ by Megadeth. Whilst there will be festival blues for many, don’t forget that the festival is going to be back next year with Gojira & Nightwish already announced. Many more bands will be announced in due course and weekend tickets are already on sale from the usual places.